Above: From the left, John Warman, Sharmella Kirby, Rachel Bodle, Carolyn Read (all MCCU Frome volunteers), Nikki Cox, Toby Eliot. FROME Town Council is delighted to announce its membership of Mendip Community Credit Union which makes them MCCU’s very first corporate member. Les had taken out a payday loan for £100 that had been rolled over, escalating to a debt of £300. He couldn’t afford to clear it at the end of the month and was desperate, knowing that the problem would only get worse. The credit union paid off the loan for him and he repaid the ‘Hand up’ fund at £15 per week, saving £2 per week at the same time. The loan cost him £15.86 in interest – had he rolled it over for another month with the payday loan company, it would have cost him £97.15 in interest and fees. Another recipient was a young mum with two children under two who was having to do all her washing in the bath or pay £20 per week at the local launderette which meant she was getting behind with her rent. She was referred to the credit union by a local charity and was granted a £160 ‘Hand up’ loan for a new washing machine. She repaid this loan at £4 per week and saved £1 per week and paid only £15.57 in interest. Had she bought a similar model on credit through one of the electrical hire-purchase shops that are springing up, it would have cost her a total of over £800! 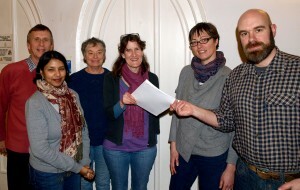 Frome Town Council has opened a savings account with the Mendip Credit Union, an organisation entirely run by volunteers, and is working closely with Fair Frome to look at how best to develop this service for the people living in the BA11 postcode area. It is intended that the profile of the credit union facilities will be raised within the local Frome community, alongside the opening of more service points, which will enable people to access the service more easily. In addition to the library on a Saturday morning, it is hoped to open the next service point at The Key Centre in Frome shortly. Fair Frome is a new organisation being set up to support local people to bounce back from the difficulties of living with poverty. Fair Frome will allocate funds into a loan guarantee scheme, administered by MCCU which will help people with ‘hand up’ loans, and offer help and support when needed. Hand up loans are for small amounts which will make a real difference to someone’s life, but where the applicant hasn’t saved before borrowing. Before a loan is agreed MCCU work closely with the applicant to assess their finances and put together a comprehensive budget to ensure that the proposed repayments are affordable. The credit union is a fantastic way to help support local people and encourage responsible and fair lending to people in their hour of need. Hand up loans are particularly intended for those people who are unable to access lending in a traditional way and find themselves looking at doorstep or Pay Day Lenders as a last resort. To find out more information about how to join simply log on to www.mendipcommunitycu.org.uk or visit the service point in Frome Library every Saturday morning, 10.00am-12.00noon.